LIBERAL, Kan. – One day after being named the Jayhawk West Player of the Week for the fourth time in her career, sophomore right side Giovanna Tapigliani has been named the NJCAA Division I National Offensive Player of the Week for the first time in her career. Tapigliani was instrumental last week as the Lady Saints came up with important wins over (RV) Yavapai and No. 4 Salt Lake. In the two matches against the ranked opponents, she came away with 34 kills and just two errors. She also finished with her first double-double of the season, and 11th of her career, against Chandler-Gilbert, finishing with 12 kills and 14 digs. Tapigliani helped extend the Seward win streak to 10 games, as they now sit at 10-2 on the season, tied for first place in the Jayhawk West at 4-0. 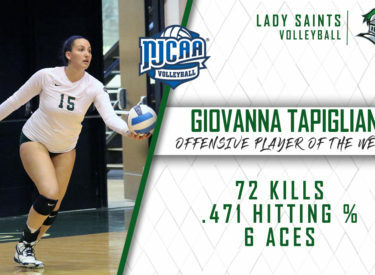 Tapigliani is the first Lady Saint to be named NJCAA Division I National Player of the Week since setter Amanda Pereira won the award in the final week of the 2016 season. Seward will play tonight in the Greenhouse at 6:30 p.m. as they host Pratt for a Jayhawk West clash.